Spray 12-inch nonstick skillet with cooking spray; heat over medium-high heat. Cook chicken in skillet 3 to 5 minutes, stirring frequently, until light brown. Stir in tomatoes and beans; reduce heat to medium-low. Cook uncovered 8 to 10 minutes, stirring frequently, until chicken is no longer pink in center. Sprinkle each serving with cheese. Wow, what a calorie saver! 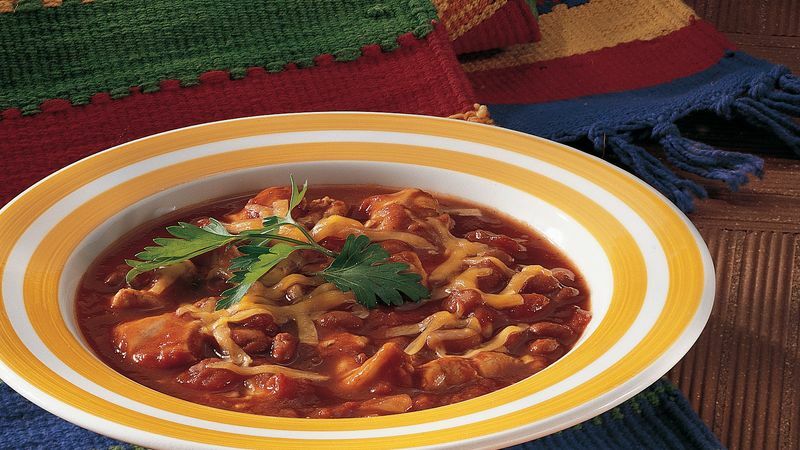 This tongue-tickling recipe has about half the fat and 70 calories fewer per serving than regular chili con carne. Don’t forget the toppings! Sour cream, sliced green onions and Bac~Os® are great chili toppers.